In orthodox Mormonism, the term God generally refers to the biblical God the Father, whom Latter-day Saints sometimes call Elohim, and the term Godhead refers to a council of three distinct divine persons consisting of God the Father, Jesus (His firstborn Son, whom Latter-day Saints sometimes call Jehovah), and the Holy Ghost (Holy Spirit). Latter-day Saints believe that the Father, Son, and the Holy Ghost are three distinct beings, and that the Father and Jesus have perfected, glorified, physical bodies, while the Holy Ghost is a spirit without a physical body. Latter-day Saints also believe that there are other gods and goddesses outside the Godhead, such as a Heavenly Mother who is the wife of God the Father, and that faithful Latter-day Saints may attain godhood in the afterlife. Joseph Smith taught that God was once a man on another planet before being exalted to Godhood. This conception differs from the traditional Christian Trinity in several ways, one of which is that Mormonism has not adopted or continued the doctrine that the Father, Son, and Holy Spirit are of the same substance or being. Also, Mormonism teaches that the intelligence dwelling in each human is coeternal with God. 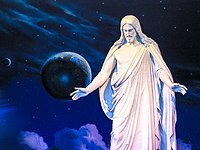 Mormons use the term omnipotent to describe God, and regard him as the creator, they understand him as having absolutely unlimited power, but do not teach that he is the ex nihilo creator of all things. The Mormon conception of God also differs substantially from the Jewish tradition of ethical monotheism in which elohim (אֱלֹהִים) is a completely different conception. Lectures on Faith were included as part of the 1835 Doctrine and Covenants. They were eventually removed from the Doctrine and Covenants by the LDS Church and the Community of Christ on the grounds that they had never explicitly been accepted by the church as canon. Most modern Latter Day Saints do not accept the idea of a two "personage" Godhead, with the Father as a spirit and the Holy Spirit as the shared "mind" of the Father and the Son. Moreover, many Mormon apologists propose a reading of Lectures on Faith that is consistent with Smith's earlier or later doctrines, by putting various shadings on the meaning of personage as used in the Lectures. During this period, Smith also introduced a theology that could support the existence of a Heavenly Mother. The primary source for this theology is the sermon he delivered at the funeral of King Follett (commonly called the King Follett Discourse). The LDS Church believes that a Heavenly Mother exists, but very little is acknowledged or known beyond her existence or the number of Heavenly Mothers as early LDS leaders did teach that it was "clearly shown that God the Father had a plurality of wives." The Church of Jesus Christ of Latter-day Saints (LDS Church) holds that the Father and the Son have glorified physical bodies, while the Holy Ghost has only a body of spirit. This theology is consistent with Smith's 1838 account of the First Vision. This account, published as part of the church's Pearl of Great Price state that Smith saw a vision of "two personages", the Father and the Son. Mormon critics view this 1838 account with skepticism, because Smith's earliest accounts of the First Vision did not refer to the presence of two beings. The church also teaches that its theology is consistent with the Biblical account of the baptism of Jesus which referred to signs from the Father and the Holy Spirit, which the denomination interprets as an indication that these two persons have distinct substance from Jesus. Smith taught that there is one Godhead and that humans can have a place, as joint-heirs with Christ, through grace, if they follow the laws and ordinances of the gospel. This process of exaltation means literally that humans can become full, complete, joint-heirs with Jesus and can, if proven worthy, inherit all that he inherits. Leaders have taught that God is infinitely loving, though his love "cannot correctly be characterized as unconditional." Though humanity has the ability to become gods through the Atonement of Jesus, these exalted beings will remain eternally subject to God the Father and "will always worship" Him. Among the resurrected, the righteous souls receive great glory and return to live with God, being made perfect through the atonement of Christ. Thus, "god" is a term for an inheritor of the highest kingdom of God. The Community of Christ, formerly the Reorganized Church of Jesus Christ of Latter-day Saints, affirms the doctrine of the trinity. The trinity is described in Community of Christ as a "living God who meets us in the testimony of Israel, is revealed in Jesus Christ, and moves through all creation as the Holy Spirit...[a] community of three persons." This belief is consistent with the earliest versions of the text of the Book of Mormon and the First Vision accounts. Latter-day Saints believe in an eternal cycle where God's children may progress to become "heirs of God and joint-heirs with Christ" (Romans 8:17) and thus become one with God or like God. This is commonly called exaltation within the LDS Church. In addressing this issue, former church president Gordon B. Hinckley, noted the church believes that man may become as Gods. Hinckley said that growth, learning and gaining intelligence are eternal principles, and is one of the reasons why education is important to members of the LDS Church. ^ First Presidency; Quorum of the Twelve Apostles (April 2002). "Gospel Classics: The Father and the Son". Improvement Era. Intellectual Reserve, Inc. Retrieved February 10, 2019. ^ "Godhead - The Encyclopedia of Mormonism". EOM.BYU.edu. Retrieved 17 October 2017. ^ "Godhood - The Encyclopedia of Mormonism". EOM.BYU.edu. Retrieved 17 October 2017. ^ "Gospel Principles Chapter 47: Exaltation". LDS.org. Retrieved 17 October 2017. ^ "Premortal Life - The Encyclopedia of Mormonism". eom.byu.edu. Retrieved 17 October 2017. ^ "Omnipotent God; Omnipresence of God; Omniscience of God - The Encyclopedia of Mormonism". eom.byu.edu. Retrieved 17 October 2017. ^ Alexander (1980, online p. 1). ^ Bushman (2008, p. 6) (Mormons believe in what is sometimes called "social trinitarianism," meaning the three beings of the Godhead are blended in heart and mind like extremely close friends, but are not one being); Early passages in Smith's revelations could be interpreted as traditionally trinitarian, but the doctrine of three Gods in one soon gave way to a Father, Son and Holy Ghost, three distinct beings united in purpose and will but not in substance. See also: D&C 130:22. ^ Salai, Sean S.J. (2015-08-19). "Catholic and Mormon: Author Q&A with Professor Stephen H. Webb". America. Retrieved 19 August 2015. 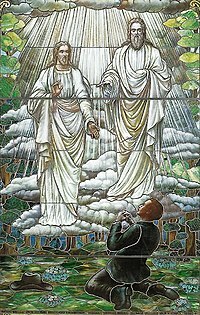 Mormons emphasize the relative independence of the three divine persons of the Trinity. Many theologians today, whatever their church tradition, are developing what is called a "social Trinity," which is very similar to Mormonism in seeing the Trinity as a society of persons rather than a single immaterial substance defined by a set of internal relations. ^ Butler, Shanna (February 2005). "What Happened to Christ's Church?". Liahona. LDS Church. Retrieved 2014-02-24. ^ Draper, Richard D. (April 1984). "The Reality of the Resurrection". Ensign. LDS Church. Retrieved 2014-02-24. ^ "Doctrinal Trends in Early Christianity and the Strength of the Mormon Position" (PDF). Fairmormon.org. Retrieved 2014-02-24. ^ Thomas Mozley "The Creed, or a Philosophy" 1893 p 303. ^ "Trinity > History of Trinitarian Doctrines (Stanford Encyclopedia of Philosophy)". plato.stanford.edu. Retrieved 17 October 2017. ^ "God, Godhead". Lds.org. Retrieved 17 October 2017. ^ "Ether 3". Lds.org. Retrieved 17 October 2017. ^ "3 Nephi 11". Lds.org. Retrieved 17 October 2017. ^ "Ether 3". scriptures.lds.org. Retrieved 17 October 2017. ^ "3 Nephi 19". scriptures.lds.org. Retrieved 17 October 2017. ^ Widmer (2000, p. 6). ^ "Doctrine and Covenants 130". scriptures.lds.org. Retrieved 17 October 2017. ^ "Sunday Evenings With The Doctrine and Covenants. Section 130. Part I. The Manuscript Source of D&C 130". Bycommonconsent.com. 3 February 2013. Retrieved 17 October 2017. ^ "Mother in Heaven", lds.org, accessed 13 April 2016. ^ Spencer W. Kimball, "The True Way of Life and Salvation", Ensign, May 1978, p. 4. ^ Swanson, Vern G. (2013). "Christ and Polygamy". Dynasty of the Holy Grail: Mormonism's Holy Bloodline. Springville, UT: Cedar Fort, Inc. p. 247–259. ISBN 9781462104048. Dr. William E. Phipps noted that the belief that 'Jesus married, and married often!' was used to encourage and promote the doctrine of polygamy amongst timid Latter-Day Saints ... By the late-1850s the idea that more than one woman was married to Jesus was widely accepted among Mormon circles. ... As if the concept of Christ's polygamy was not unsettling enough, Mormonism even taught in the nineteenth century that God the Father had a plurality of wives as well. ^ "Moroni 10". Lds.org. Retrieved 17 October 2017. ^ "Doctrine and Covenants 76". Lds.org. Retrieved 17 October 2017. ^ "Doctrine and Covenants 84". Lds.org. Retrieved 17 October 2017. ^ Nelson, Russell (February 2003). "Divine Love". lds.org. LDS church. ^ Kurt Widmer, Mormonism and the Nature of God: A Theological Evolution, 1833-1915 (Jefferson, NC: McFarland & Company, p. 2000), 92. ^ "Basic Beliefs". Community of Christ. Community of Christ. Retrieved 1 October 2017. ^ Lattin, Don (April 13, 1997). "SUNDAY INTERVIEW -- Musings of the Main Mormon / Gordon B. Hinckley, 'president, prophet, seer and revelator' of the Church of Jesus Christ of Latter-day Saints, sits at the top of one of the world's fastest-growing religions". San Francisco Chronicle. Retrieved July 16, 2012. Q: There are some significant differences in your beliefs. For instance, don't Mormons believe that God was once a man?